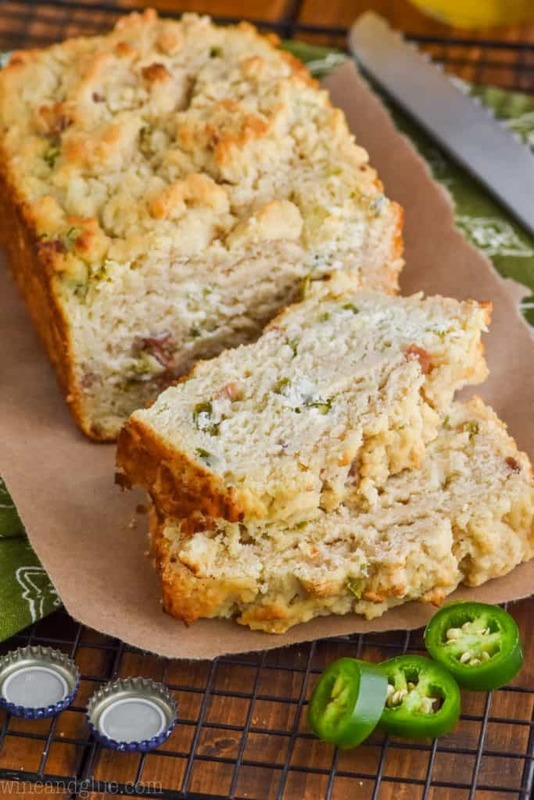 This Loaded Jalapeño Popper Beer Bread recipe is an easy twist on my delicious three ingredient beer bread! 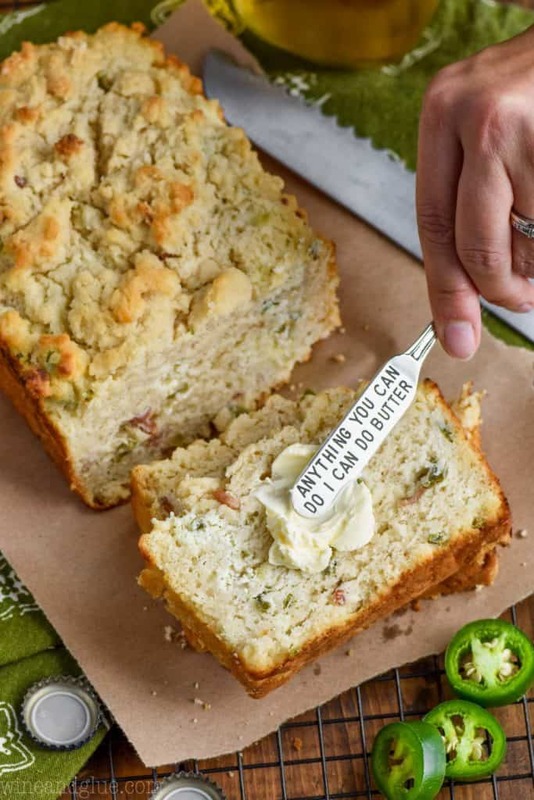 The delicious taste of jalapeño poppers in moist and rich beer bread! 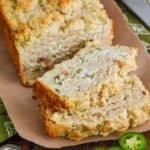 This beer bread recipe is the perfect thing to put out on game day next to the instant pot cocktail meatballs and the vegetable dip. It’s also great just on the side of a rich and delicious bowl of this slow cooker chicken enchilada soup! Happy Monday guys! Did you have a good weekend? I had an absolutely magical weekend. My incredible and generous sister in law came to stay with my kids so that Nathan and I could have a night away to celebrate his birthday. This is going to sound so cheesy, but it felt like hanging out with a boyfriend I had only been dating for a few weeks but was super into. Magical marital moments are so hard to come by at this stage in life, so I’m still basking in the amazingness of it. The madness of our morning weekday rush this morning didn’t even deflate me. ???????? I’ll stop before I either make you gag or irritated. Should we talk about something else magical? 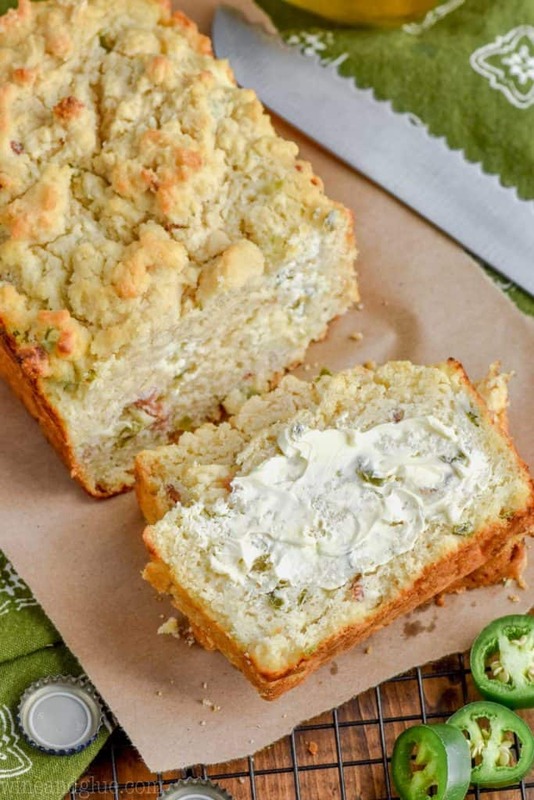 Like this Jalapeño Popper Beer Bread recipe? ALL THE BEST JALAPEÑO POPPER RECIPES! I am constantly wanting to turn everything into a jalapeño popper recipe, because honestly is there anything better than a spicy jalapeño stuffed with cream cheese and wrapped in bacon? It think not. I have Jalapeño Popper Pinwheels that you will want to make babies with. Then there are these Jalapeño Popper Potato Skins that are so easy but so satisfying. I also made this Jalapeño Popper Pull Apart Bread that is all things cheesy, rich, and amazing! Finally, if you insist, we will throw a dinner recipe in there with this Jalapeño Popper Stuffed Chicken. 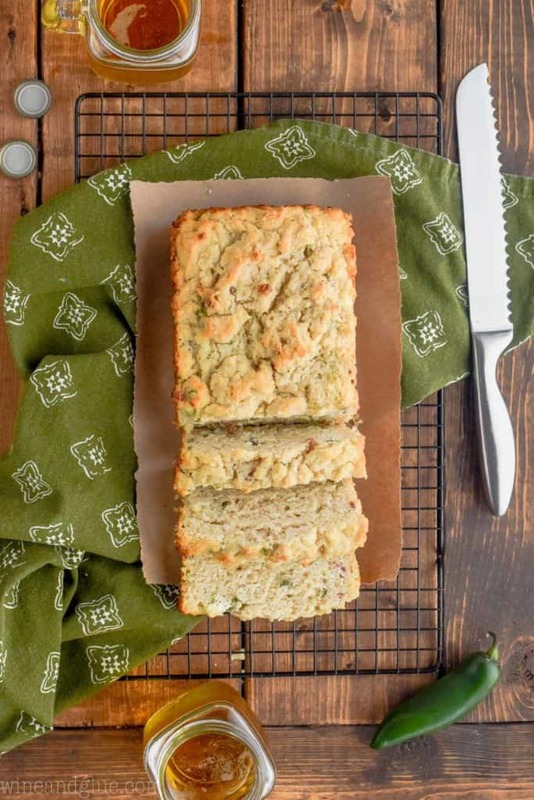 This Jalapeño Beer Bread Recipe is amazing because it is super easy, but is delicious! It has a little kick from the jalapeños but the coolness of the cream cheese to balance it out. Its just one of so many twists you could make with the base of my 3 ingredient beer bread. WHAT TYPE OF BEER SHOULD I USE TO MAKE BEER BREAD? The simple answer to this question is any type of beer that you really like. The taste of the beer will become more concentrated in the bread, so make sure it is one that you like to drink. 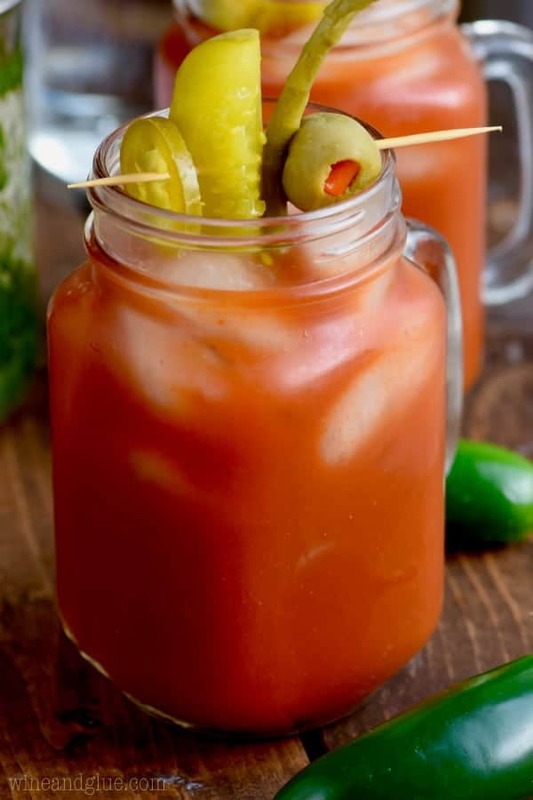 If you don’t like drinking beer, you will still love this recipe! If that is the case, just grab a light pilsner beer like Bud Light or Miller Light. Those are great options for this bread. A darker beer like an IPA is going to give this bread a really distinct flavor, so make sure you love those if that is what you plan on using! 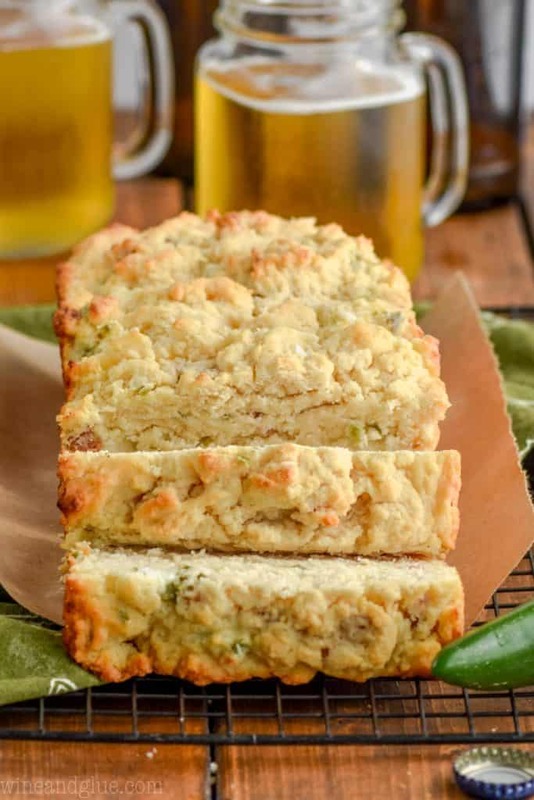 HOW DO YOU MAKE THIS BEER BREAD RECIPE? 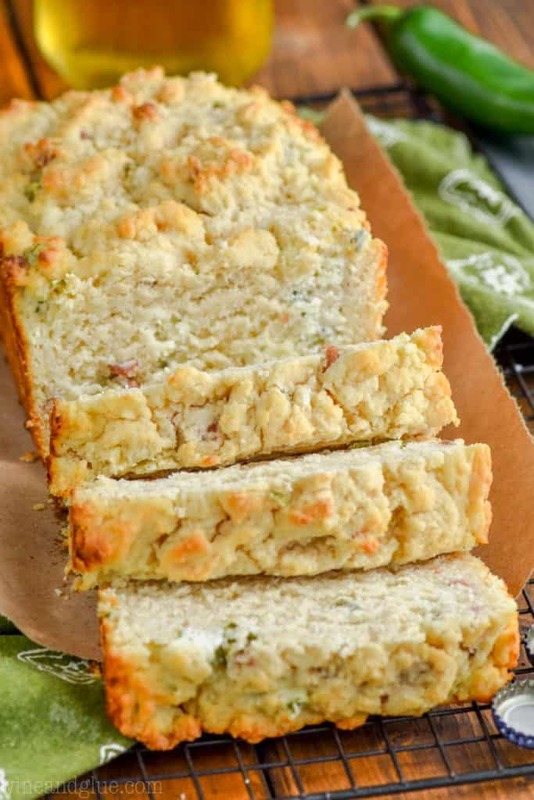 This beer bread recipe is super easy to throw together. Start with some room temperature cream cheese and use a hand mixer to beat it with the jalapeños. Mix together your self rising flour (found near the all purpose flour in the grocery store) and sugar. Then mix in the cooked, crumbled bacon. Finally fold in the cream cheese. Pour it all in a greased bread pan and pour melted butter on top. Bake and enjoy! Typically, beer bread, though enjoyable is a little on the dry side. But not this recipe! The cream cheese makes it moist, and the jalapeños and bacon give it a delicious don’t want to miss flavor. And with the self-rising flour it comes together super easy! 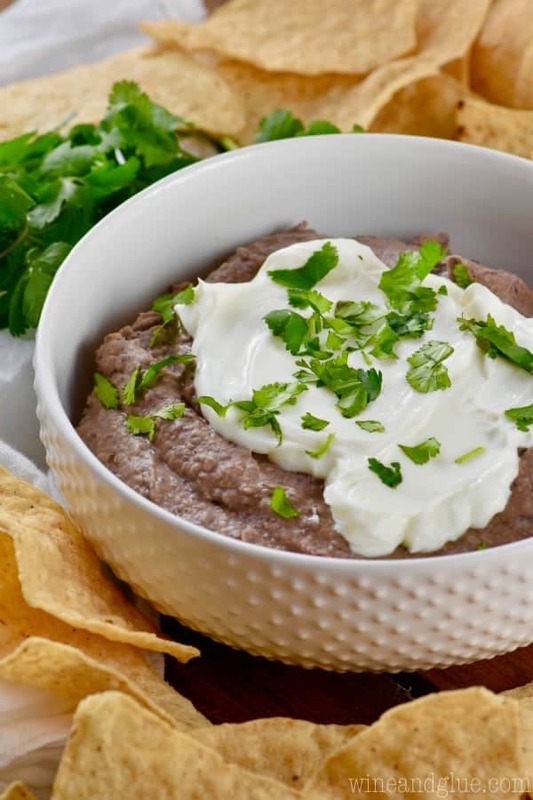 It is the perfect game day recipe and would be a great addition to any party! 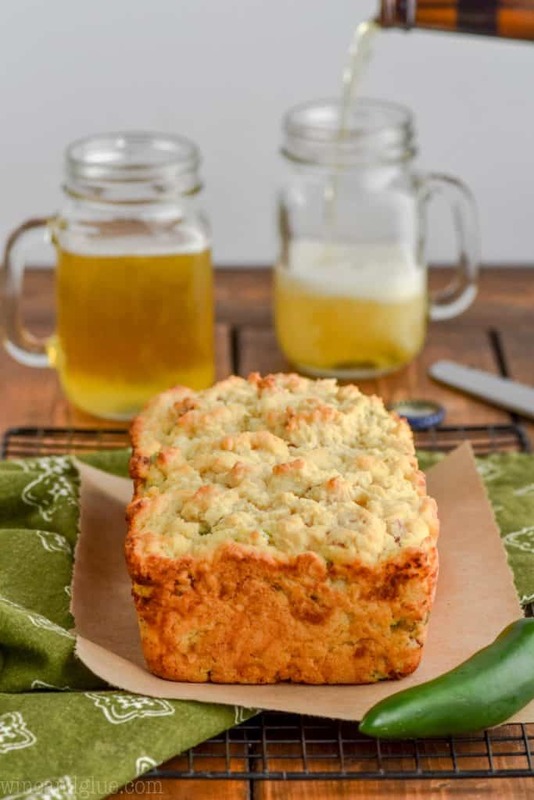 This Loaded Jalapeño Popper Beer Bread recipe is an easy twist on my delicious three ingredient beer bread! The delicious taste of jalapeño poppers in moist and rich beer bread! Preheat your oven to 375 degrees. Grease a 9 inch bread pan and set aside. With a hand mixer beat together the jalapeños and the cream cheese until combined, about two minutes. In a large bowl, mix the self-rising flour and the sugar together. Then mix in the crumbled bacon. Gently stir in the beer. Once it is fully integrated, stir in the jalapeño and cream cheese mixture. Pour the batter into the prepared bread pan. Pour the melted butter over the top. Bake for 40 minutes or until the top is golden brown. Allow the bread to rest in the pan for 10 minutes before removing and to cool completely. Best if enjoyed within two days of baking. 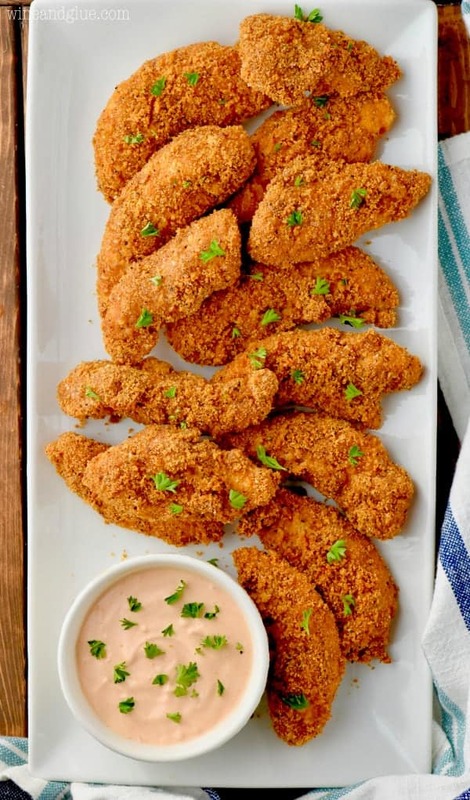 Looking for more recipes that are great for game day? I made bread on Saturday and Monday and pizza dough on Sunday. This recipe is dangerous and as you can see I already have a bread making addiction 🙂 This looks amazingly delish! But really. Is there anything better than a good carb loaded recipe?? I need to make it more fun!!! And add this bread, because OMG. SO good! Your dinners sound a lot like ours except Bryce likes “Why did the chicken cross the road?” type jokes and they just NEVER make any sense but we can’t help but laugh because he’s so tickled with himself 🙂 So sweet. Oh. My. Goodness. All I can say is I wish we had this with our chilli on Sunday – it would have been perfect! Definitely going to make it on the menu soon though! Pinned! I know exactly what you are talking about! Those sound like Gavin’s jokes! Thanks so much for the pin Trish!! I would say our dinners are funny too….but the reality is they’re just sheer chaos. Because none of my kids know when to quit! I love your Quinny stories – she cracks me up 🙂 And I seriously love this recipe!!! I have to admit that I’ve never made beer bread before! Seeing all of your yummy pictures makes me think I’m seriously missing out. I gotta try this! Also, kids are crazy and say the funniest things! I love it!! Oh, it’s SO easy!!! I thought it was all tricky, but a bread that only has like three main ingredients? Yes please! Your kids sound adorable! And this bread looks awesome! Love the jalapenos and cream cheese – yum! They definitely have their moments. Thanks Lindsay! Hee – your dinners sound like mine. My 6-year old is totally into “joke” telling right now, usually ones he’s made up and we don’t get. But the laughter is totally real and I love it and I wish I could box it up and carry it with me forever. 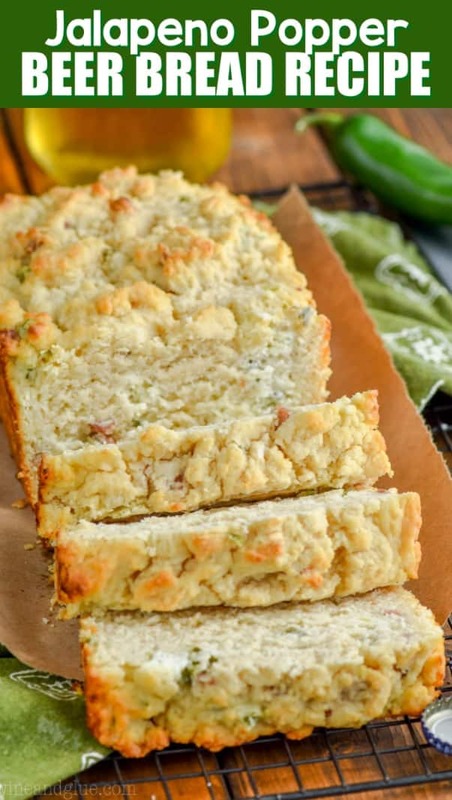 LOVE this bread – beer bread is a staple for me during football (any/all) season, and a popper version? Heck, yes. Isn’t kid humor the best?? Thanks Ashley! So this just made me feel hungry again. I’m making a variety of breads for co-worker’s Christmas gifts this year and I’m going to try yours this weekend to be included in my selection of breads. What kind of beer did you use? My (adult) kids all have their favorites, but I’m looking for some additional suggestions on what to try . . .
Hi Stephanie! The only types of beer that I’ve used in beer bread is pilsners, but that’s what I like to drink. I have read that making beer bread is a lot like cooking with wine, whatever taste you go with for the alcohol is only going to intensify once you cook it, so be sure to choose something that you like! I like the pilsner because it has a nice mild flavor that doesn’t make the bread too bitter. I hope that helps! I know this might be a dumb question, but is self rising flour the same as all purpose flour? Hi question for you – Can you use a carbonated beverage instead of beer? I know the ‘beer cooks out’ but we aren’t a fan of beer, and have often sub’d sprite or some other 7up type of soda for the beer. Do you think it’ll work in this, or should I just try it and report back? LOL We have a friend who LOVES jalapeno and this would make a nice travel gift for him since he travels all the time. . . Wonderful! I’ll keep you posted 🙂 thanks for the quick reply! Thanks for the quick reply! I may try it and let you know! Can the beer bread be converted to gluten free? I think so! You could try making your own self-rising flour (there are lots of great recipes for it, found by searching google), and then you could use a gluten free flour when making the self-rising flour. IPAs aren’t dark beers but great recipe!